In the essay "The J. W. Rimington-Wilson Library (part 1)," I wrote about the February 1928 Sotheby's sale of the Rimington-Wilson chess library. The most interesting lot was a manuscript said to be in the hand of Oliver Goldsmith, a translation of Vida's 1527 poem Scacchia Ludus (The Game of Chess). The London bookseller Maggs purchased the lot for the astonishing sum of £5600. I wondered where the manuscript was today and was interested in learning more generally about finding aids for 18th century manuscripts. I posted a query to the EXLIBRIS listserv, and members there helped me trace the manuscript for another year. In January 1929, the manuscript was sold in the major sale of the Jerome Kern collection at Anderson Galleries. The Vida manuscript sold for $27,000 (see American Book Prices Current, VOL. XXXV, available for download). I recently had the pleasure of meeting Anthony Tedeschi, Rare Books Librarian at the Dunedin Public Libraries in New Zealand. Anthony writes a charming and recommended blog on rare books and special collections in Australasia—Antipodean Footnotes. Anthony pointed me to a June 17, 1930 headline in the New York Times that both added detail and intrigue to the manuscript's provenance. The headline read "NEW YORK COMPOSER SUES BOOK DEALER" and the sub-head continued "Jerome Kern Seeks Return of $32,998.10 Paid Philadelphian for Translation by Goldsmith." Intrigue indeed. Jerome Kern of Bronxville, N. Y., composer of "Show Boat" and other musical plays, brought suit in the Federal court here today against Charles Sessler of Merion, well-known book dealer, asking for the return of $32,998.10, the purchase price of Oliver Goldsmith's translation of Vida's "Game of Chess." 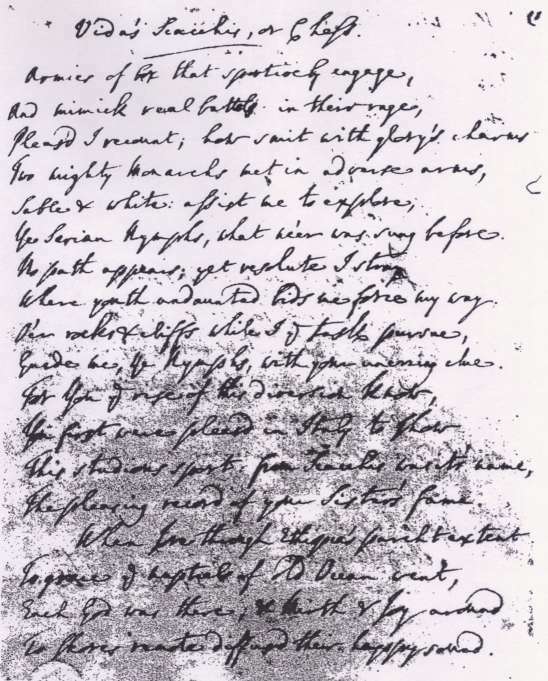 Mr. Kern declares he bought the manuscript, which is composed of 679 lines of 34 pages, from Mr. Sessler on the latter's representation that it was in Goldsmith's handwriting. On Jan. 29, 1929, he contends, he learned that the handwriting was not Goldsmith's and says that the manuscript therefore is "of no value whatever." In his complaint the composer asserts that he has demanded the return of the money on several occasions, but that Mr. Sessler has refused to refund it. The Philadelphia dealer in February, 1928, purchased through an agent in London the purported manuscript of the translation at a reported price of $28,000 and sold it to Mr. Kern. Early last year the composer included it with the rest of his notable private collection of rare books and manuscripts which he placed on the auction block. The collection netted him almost $1,8000,000. The manuscript, which was catalogued at the sale as the longest poetical manuscript by Goldsmith known to exist, went for $27,000 to a bidder whose name was given out after the sale as Mr. Perkins. The bidding had opened at $10,000. Mr. Sessler said that the purchase of the manuscript at the auction returned it to Mr. Kern, but the Philadelphia dealer declared he personally still believed it was in Goldsmith's own handwriting. So, it appears that Maggs was acting on behalf of Sessler at the Rimington-Wilson sale and Sessler sold the manuscript to Kern. THE LONGEST POETICAL MANUSCRIPT BY OLIVER GOLDSMITH KNOWN TO EXIST. Katherine C. Balderston in her Census (New York, 1926) records only three others; two copies of The Capitivity and the rejected Epilogue to She Stoops to Conquer. The manuscript now offered is longer than all these together it was formerly in the possession of Bolton Corney, and was described by Forster in his Life of Goldsmith, 1848, but remained unpublished in its entirety until 1855, when it was included in Peter Cunningham's edition of the Works. Corney died in 1870, and the manuscript was sold by Mr. F. S. Ellis to Mr. J. W. Rimington-Wilson in the following year. Miss Balderston was unable to trace its history beyond Bolton Corney. Two letters from Mr Ellis relating to its sale are included with the lot. AUTOGRAPH MANUSCRIPTS OF OLIVER GOLDSMITH ARE OF EXTRAORDINARY RARITY. [I shall describe] Vida's Game of Chess in the English heroic metre, as it has been found transcribed in the writing of Oliver Goldsmith by my friend Mr. Bolton Corney, whose property it is and who kindly permits my use of it. It is a small quarto manuscript of thirty-four pages, containing 679 lines, to which a fly-leaf is appended, in which Goldsmith notes the differences of nomenclature between Vida's chessmen and our own. It has occasional interlineations and corrections, but rather such as would occur in transcription than in a first or original copy. Sometimes, indeed, choice appears to have been made (as at page 29) between two words equally suitable to the sense and verse, as "to" for "toward;" but the insertions and ensures refer almost wholly to words or lines accidentally omitted and replaced. 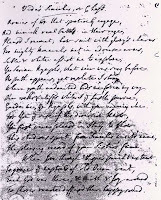 The triplet is always carefully marked and though it is seldom found in any other of Goldsmith's poems, I am disposed to regard its frequent recurrence here as even helping in some degree to explain the motive which had led him to the trial of an experiment in rhyme comparatively new to him. If we suppose him, half-consciously it may be, taking up the manner of the great master of translation, Dryden, who was at all times so much a favourite with him, he would certainly be less apt to fall short in so marked a peculiarity than to err, perhaps, a little on the side of excess—though I am far from thinking such to be the result in the present instance. The effect of the whole translation is really very pleasing, and the mock heroic effect appears to be not a little assisted by the reiterated use of the triplet and alexandrine. As to any evidences of authorship derivable from the appearance of the manuscript, it is only necessary to add another word. The lines in the translation have been carefully counted, and the number is marked in Goldsmith's hand at the dose of his transcription. Such a fact is of course only to be taken in aid of other proof; but a man is not generally at the pains of counting,—still less, I should say, in such a case as Goldsmith's, of elaborately transcribing,—lines which are not his own. Forster is at pains, it seems to me, perhaps due to his friendship with Corney, to describe the manuscript as authentic. His comments about such details at the marking of triplets and the counting of lines are rather strained. I am still hopeful of locating the manuscript.I have found no online information about the litigation between Kern and Sessler, nor are there digital copies of Philadelphia newspapers available from that time. So more digging is required. Anthony had some other suggestions for further research. He notes that the Sessler papers are held by the Historical Society of Pennsylvania in Philadelphia, with a finding aid for the archive online. There is a substantial Kern archive at the Library of Congress, although that appears to relate only to his music. In the mean time, the Sotheby's catalogue of the Rimington-Wilson catalogue included a reproduction from the Vida manuscript, which I include here with the thought that someone may be expert in identifying Goldsmith's handwriting.